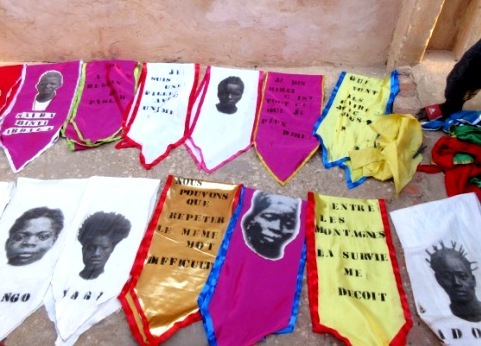 More from the OFF - Dak’Art 2018... newsletter#015 will be the last discourse on our art adventures in Senegal. 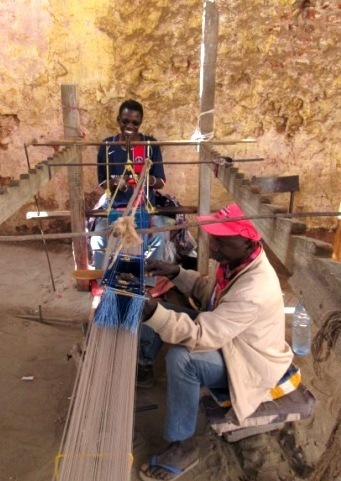 This one is more intent on sharing the work of some of the amazing artists we came into contact with on our travels out of the capital: St Louis, north of Dakar and Toubab Dialow, down the coast to the south of the city. 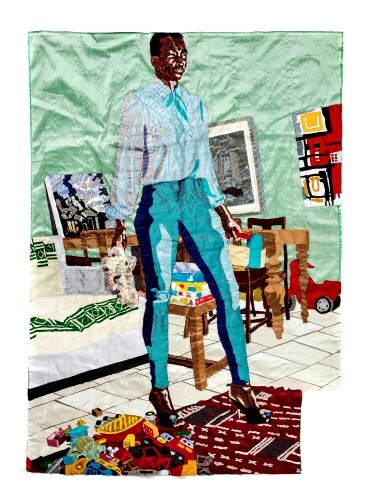 THREAD ART: Johanna Bramble, Senegal/France. 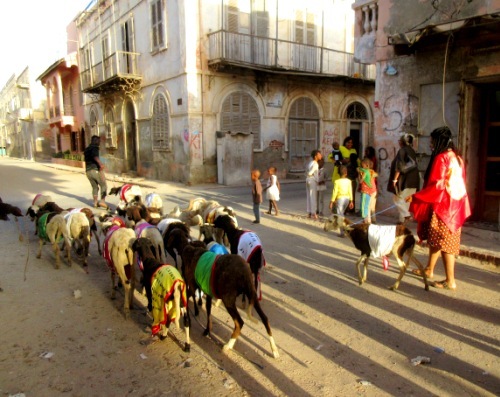 This was actually the last exhibition we attended in Dakar before leaving the city. 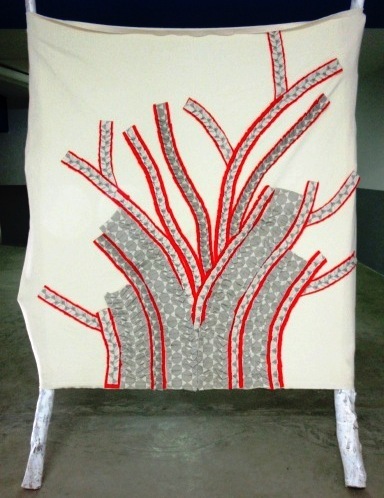 Titled ‘Aborescence’ Bramble had turned an underground garage in the suburbs into a stage for her artwork. 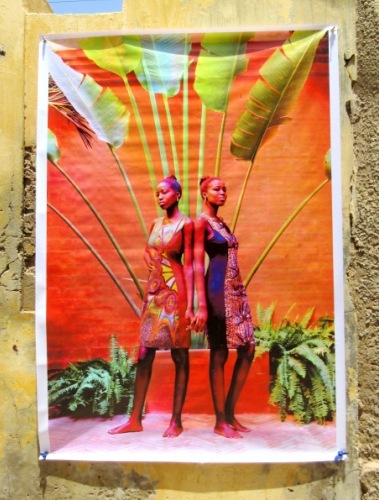 While Bramble’s commercial fabrics were known to me before coming to Senegal this was a show featuring her own personal development as an artist and I thoroughly enjoyed the quieter feel to it after the frenetic energy of the main Dak'Art events. 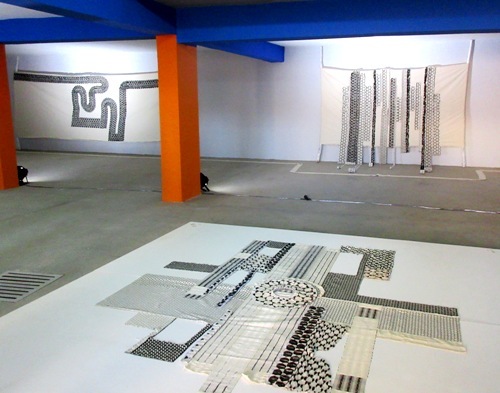 Featured were many pieces that were mounted on canvases, playing with free-form shapes and manjak motifs; more precisely the hexagram ‘Biddew’ pattern which she uses in a double structure to punctuate most of the work. 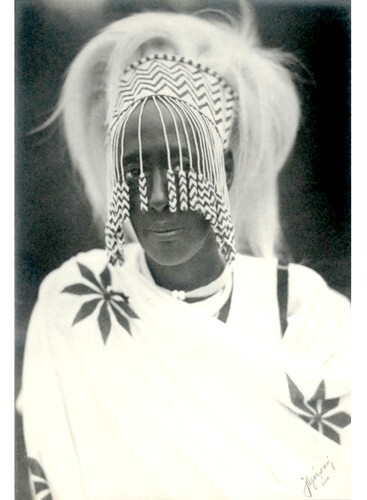 Often the back of a weave becomes her front, forcing us to really see the thread which is ‘the path which leads to the heart of her intimacy, her identity’. 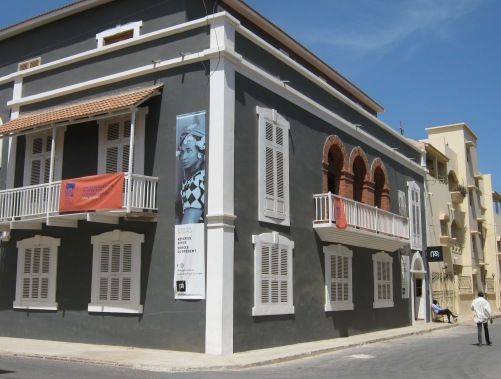 This gloriously elegant and recently renovated heritage building was showing both historical collections of photographs and exhibitions of the work of contemporary photographers. 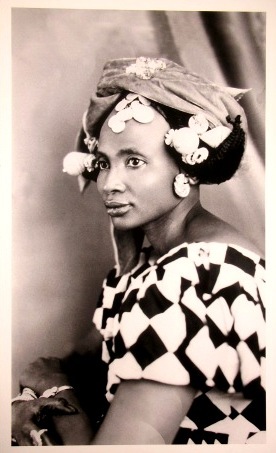 The collected works of photographer James Barnor from 1948-1980 were found in one room and a collection titled “Reveries d’hier” from the 1930’s to 50’s belonging to the owner of the museum, Amadou Diaw in another. Portraiture was a favourite topic portrayed in both a traditional and contemporary manner throughout including images from Laeila Adjovi, Joanna Choumuli, Mario Macilau, Omar Victor Diop and local Malik Welli amongst others. 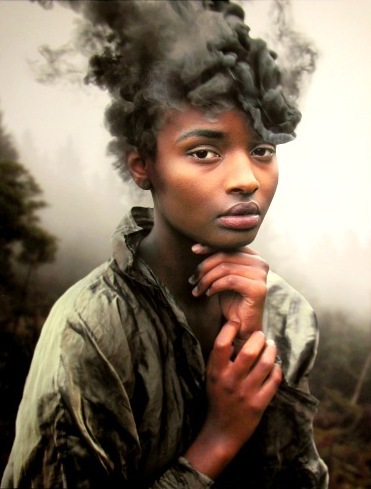 My out and out favourite was this beautiful image called ‘Wild Fire’ by photographer David Uzochukwu. Of Austrian and Nigerian descent and still under 20 in age, his portraits show a technical prowess and emotional connection far beyond his tender years and his subjects appear to exude a sense of loss and loneliness. This proved to be an extraordinary experience. Collection and starting point for the performance piece was at the photographic museum in late afternoon. 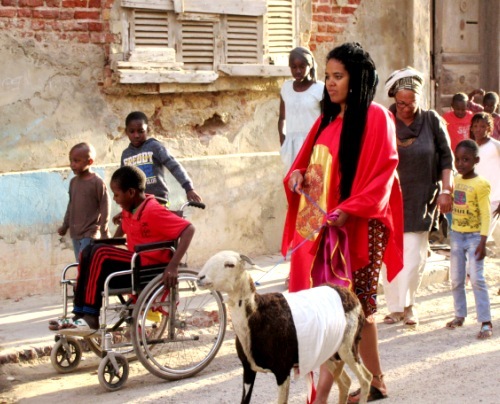 Together with a flock of adorned, draped sheep and their shepherd we traversed the streets of St Louis following Ms Bikoro while she called out “Madame Tirailleur” in a voice that summoned us to pay attention.. but we weren’t entirely sure for what?? We obeyed, entering into the swing of things and enjoying the sweet afternoon light slanting down through the streets... while awaiting and hoping for some insight and clarity at the other end! At the establishment “Au Fil Du Fleuve’ we listened while Nathalie passionately and intensely informed us about the history of Senagalese women (including her grandmother) who went to war, serving on the frontline alongside their menfold and enduring all sorts of unendurable things... their role and even their existance never to be recognized, compensated or acknowledged. This performance piece is Nathalie’s homage to her grandmother and all the other women who went to war.. their faces are printed on the silk cloths adorning the sheep, images belonging to mothers, sisters, daughters and wives. We left that evening feeling all roughed up and rumbled.. our smooth edges shattered. What else in this world have we no knowledge of... what else is discounted, covered up and swept away??? 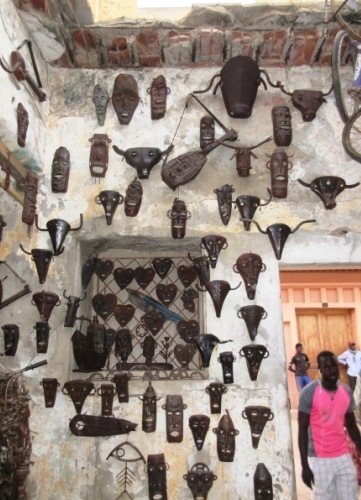 Somehow, however, we felt fuller for the experience, richer for being witness and full of desire to know more about this piece of Senegalese and West African history. If it weren’t for activists like Nathalie this deserving story would never see the light of day. MAI DIOP is the owner of Tesss Atelier in St Louis. Underneath a covered shelter just off the street you can watch her weavers patiently and reverently weaving a long, long piece of cloth in an intricate pattern and with bright colours. 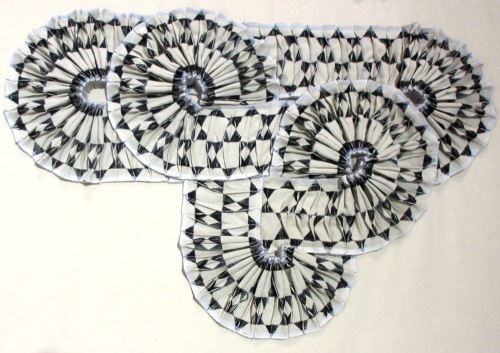 These strips are sewn together to produce all manner of items like one-off bedspreads, wall hangings, table-cloths etc. For Dak ‘Art OFF, Mai had a small exhibition of her own work.. waxed strip pieces that if you hold to the light appear see-through with all the textures and fibres showing through. These beautiful pieces have the solemnity of Japanese work, pure and somber but beautifully executed. 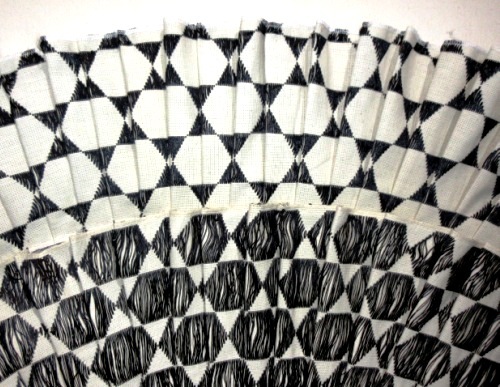 I purchased a long narrow piece for my textile collection and it feels like many things.. like De Launey, like Kuba, like stained glass.. I know I will never tire of it. Like I said no matter where you went there was something to be seen!!! When I left Dakar I said to myself I don’t think I will be back... too overwhelming, too stretching. Now I know I am going to be one of those zealots who will find it very difficult to think of missing out… here’s to 2020! 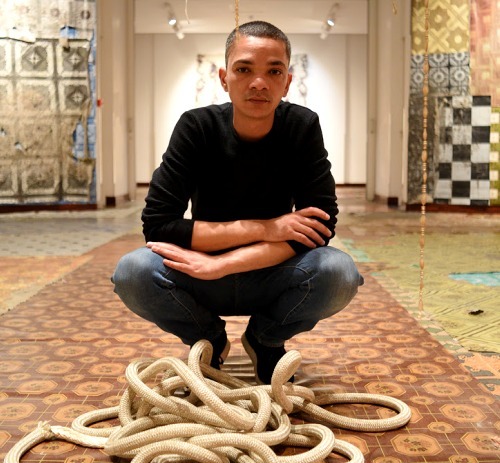 This young artist from Cape Town has been announced as the prizewinner of the FNB 2018 Joburg Fair art prize. 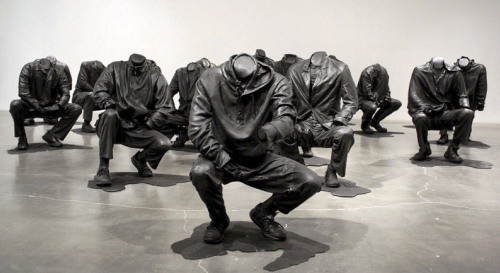 A worthy winner, his art besides being jaw-droppingly proficient is confrontational, relevant and alludes to a shameful situation that SA would probably rather forget... No chance with this powerful piece. Malawian-born Billie Zangewa has been announced as the Featured Artist for the 2018 edition of the FNB JoburgArtFair. 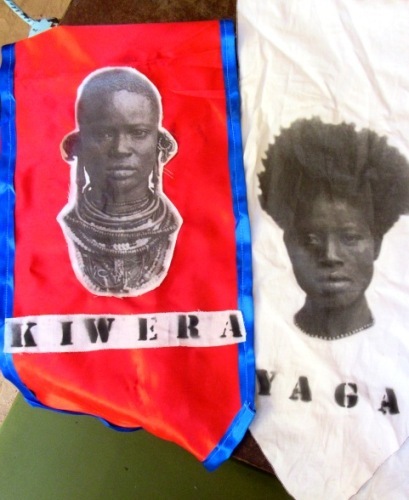 Zangewa, with her silk, stitched tapestries woven to create a paint-esque effect, has quietly found her way into collections all over the world. She addresses her own issues that have shared realities with many people in Africa and beyond. One exhibition I really wish I had been able to visit in July was ‘Talisman in the Age of Difference’ curated by Yinka Shonibare at the STEPHEN FRIEDMAN GALLERY, London. Artists included were Faith Ringgold, Kudzanai-Violet Hwami, Genevieve Gaignard, Marlene Dumas, Wangechi Mutu, Romare Bearden, William Kentridge, Ghada Amer, Whitfield Lovell, Samuel Fosso, Derrick Adams, Kehinde Wiley, Hassan Hajjaj, Isaac Julien, Sonia Boyce, Mickalene Thomas, Zanele Muholi, Zac Ové, Abdoulaye Konaté, Otobong Nkanga, David Hammons... and more. This artist used petroleum-based resin as opposed to the traditionally used wood, to re-create Karikpo masks, which function as a vehicle for meditating on topics such as alienations, hybridity, education, and diaspora. 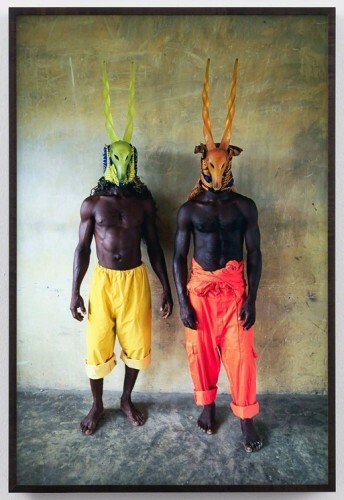 The colours of the masks reference those worn by industrial labourers and inmates in the Niger Delta and around the world. ‘When Dust Settles’ presents a body of work that explore iconographies and objects of material culture central to the shaping of Adams’ identity and upbringing in the Cape Coloured community. A large installation, it incorporates vinyl, layering the walls and floors with used and well-worn linoleum floor panels. 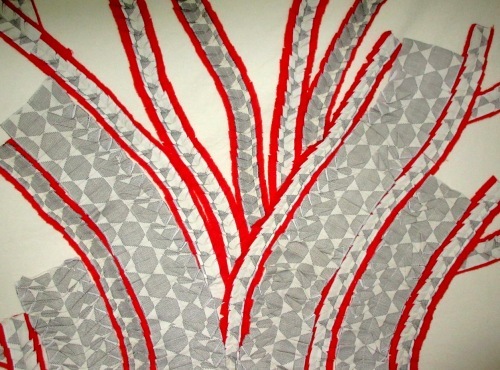 It expands on his earlier work and charts a new course for his practice as an artist. I do hope you have found this fifteenth edition of CAA newsletter interesting. For those of you who find these newsletters arduously long I am endeavoring to shorten them and I hope this will be pleasing to the majority of readers.